In the heart of downtown Reading, austere words on a simple historical marker understate the swirl of passion, tragedy and horror which engulfed the place in July 1877. Destructive, deadly violence stalked across the U.S. as a railroad work stoppage in Martinsburg, West Virginia, spread to city after city, multiplying into what is most commonly known as The Great Strike. In several major cities, pitched battles took place between riotous mobs and militia or police. Nationwide, rail traffic was paralyzed for days. In Reading, locomotive engineers had undertaken months earlier a strike of their own against the powerful Reading Railroad, but management had acted immediately to quell their action. Suddenly, the heat of national events newly agitated the city toward boiling. Three nights later, The Great Strike would leave behind in Reading charred warlike ruins, at least 10 dead and a score more wounded citizens. These are the events locally commemorated as The Reading Railroad Massacre. The Massacre is often overshadowed by The Great Strike’s blistering events in Baltimore, Pittsburgh, Chicago and St. Louis some more deadly, some more protracted than those in Reading. Nevertheless, even in that impressive larger con­text, the Reading Massacre is poignantly emblematic and uniquely instructive. The Great Strike was a formative yet profoundly defining moment for American Labor; but undervalued today for their centrality to that moment – in direct cause; in sequence of events; and in follow on development – were persons and events in Reading. Of course, the proximate genesis of The Great Strike and its impacts in each locale where it waged its fury is a unique meld of issues, personalities and events. That there was an electric commonality among such elements in diverse places – Martinsburg, West Virginia; Baltimore; Pittsburgh, Reading and Erie, Pennsylvania; Buffalo; Cincinnati and Newark, Ohio; St. Louis and Kansas City, Missouri; Omaha, Galveston, Louisville, San Francisco, and elsewhere – was The Strike’s stunning revelation. On what rests this study’s claim of Reading’s pivotal significance to events so widespread? The broad outline follows. Intended at its founding as a farm market town, Reading was by the end of the Civil War the solar plexus of a burgeoning industrial empire. Located midway between the richest anthracite coal fields in the world and the international port city of Philadelphia, the city had come to early transportation and industrial prominence – and due civic pride. The Philadelphia & Reading Railroad (“The Reading”), a pioneering enterprise begun in the 1830s, rose to quick prominence as a coal transporter. At its height in the 1870s, The Reading was one of the richest corporations in the world -not only running trains, but operating (and vigorously policing) an empire of Pennsylvania coal mines, of canals and oceangoing vessels, and even attempting a subsidiary rail venture in Brazil. Though its corporate management reigned from Philadelphia, the motive power propelling the railroad emanated from Reading, where the 36-acre engineering/production shop complex comprised a virtual fiefdom within the heart of downtown. Both The Reading and the city whose name it bore proved fertile grounds for early labor activism. The city of Reading was throughout the 1870s home to a very motivated local of the Brotherhood of Locomotive Engineers; and already by July 1877 it could boast a strong local of the new Trainmen’s Union formed in Pittsburgh but a month before among non-engineer rail workers. Subsequent events would, if anything, heighten this pro-labor trait in the growing city’s personality. Near The Reading’s highest height, in the 1870s, contentions between the railroad’s management and laborers embroiled not only engineers and other workers in the Railroad division, but miners in the Coal & Iron division (upriver 40-odd miles in Schuylkill County) as well. President Franklin Gowen of The Reading, after finagling state approval for the railroad to obtain vast coal tracts, then borrowing heavily, almost recklessly, to accomplish that end, steeped himself in the early 1870s in exertions to control the entire supply/demand dynamic for coal. Initially, in concert with various combination and price-fixing schemes he instigated and led, Gowen adopted a sort of wink-and-nod attitude towards union activities in the mines – e.g., by himself purposely precipitating a miners’ strike, he could predictably alleviate a seasonal oversupply – but when the Workingmen’s Benevolent Association (the “WBA”), modeled along the lines of an English miners union, began to value too much its role in determining the supply/demand balance, and in 1874-75 sought to flex its muscle to serve its members’ benefit as against the mine operators’, Gowen took a different tack. Ostensibly in response to longstanding lawlessness in the Schuylkill Valley coal region, Gowen arranged through Pinkerton’s detective agency an undercover infiltration of “the Mollie Maguires,” by alternate accounts either a criminal secret society, a hotbed of union agitation among Irish coal miners – or (most likely) a disorganized amalgam of hooliganism and serious labor activism, the boundaries between them blurred. To what extent Gowen himself was convinced of the validity of the Mollie Maguire conspiracy theory he rhetorically spouted, and of the moral indignation over it which he then milked, it is impossible to determine. However, Gowen’s generally sympathetic biographer concluded that, “remarking the Mollie Maguire stories he had heard [while a DA in the coal region a decade earlier], he sought by the theory of a secret society to account for the violence that usually accompanied labor disputes”; further, that he “felt it his duty to track down this supposed hand of criminals, which he considered an inner ring of the labor union” (the WBA) he was aggressively seeking to crush. Gowen personally headed up criminal prosecutions of alleged Mollies, his remarkable elocution securing convictions and multiple hangings. Altogether, Gowen’s withering campaign against the Mollies/WBA amounted to a “Reign of Terror in reverse” -i.e., run not by revolutionaries but by the dominant ruling class. Widely celebrated in the media of the day, Gowen’s triumph over the Mollies marked, however, a hard, transitory zenith. By his legal (and ostensibly moralist) elocution – “I now stand here in behalf of the laboring people of this county. ” – Gowen managed in prosecuting the Mollie Maguires to crush the WBA. In his own conception a friend of labor”… champion of the right of the individual laboring man against the tyranny of trades unions,” toward the avowed end that “not one [worker] will hereafter be obliged to submit to the degradation of asking his fellowman for leave to earn his daily bread” – nevertheless, for years workingmen of Schuylkill County would not mention his name without a curse. With almost pathological intensity this man, so determined to accomplish by loyal service to the corporation he presidented all his obligations to mankind, grew that confused in his motivations and perceptions. Little surprise that of all participants in the seesaw-like back-and-forth between labor and business in 1877 which culminated in The Great Strike, Franklin Benjamin Gowen by his every move seemed to inadvertently grease the pivot. Other railroad bosses were once again heartened by Gowen’s audacious antiunion success. While Gowen was away in Europe, taking his precedent actions as their supposed mandate, management of most American railroads summarily reduced wages. These nearly universal wage cuts were the most immediate (though not sole) precipitant of the Great Strike which suddenly gripped the heart of American commerce. Almost immediately upon his return to The Reading’s Philadelphia headquarters on July 16,1877 – the very day The Great Strike broke out in Martinsburg, WV – Gowen jumped back on the bandwagon, instituting massive layoffs across The Reading – in effect both sanctioning and reinforcing moves by the other railroads in his absence. Gowen already had a high profile due to his leadership in the earlier collective fixing of coal prices. By 1877, all of his and other railroad tycoons’ actions nationwide appeared in the public eye as consciously orchestrated, even though their industry was at the time in perhaps its most ruthlessly competitive phase. Thus Gowen’s new layoffs also served to reinforce a powerful public image of unity among the nation’s railroad bosses, and of a careless disregard for any but their own narrow monetary interests. In Reading, striking union engineers had been quickly displaced (in April-May) by “temporaries” and then blacklisted – but the nonunion strikebreakers were not paid from May through mid-July. In the face of The Great Strike’s gathering momentum, Gowen suddenly found the money to pay back wages in Reading, apparently thinking to soothe the simmering rancor among the citizens there – but actually to contrary effect, inadvertently putting his workers in a clearer frame of mind to participate in The Strike as it spread. The Great Strike stirred to life in Martinsburg, West Virginia, but sprang into riot in Baltimore (12 dead, some rioters, some militia), in odd echo of anti-war riots there at the Civil War’s outset. Pittsburgh was the next city hard hit: there, 26 died, and a hostile mob burned the Penn­sylvania Railroad terminal and a roundhouse where a besieged militia troop sought shelter overnight. Images of this chaos, death and destruction were conveyed to Reading’s collective imagination by reports of the Reading Eagleposted outside its downtown office. Crowds formed, coalesced into mobs, marched about town. The local militia was called up and dismissed as being too close in sentiment to local strikers, too likely unable to withhold the tide of disintegrating order. The engineers union local met that night. Acts of vandalism and arson were undertaken: rails were blocked or torn up; rail cars set ablaze and, overnight, a major bridge connecting Reading with all points west. Civil authorities disparaged any attempt to raise a peacekeeping posse as futile. A unit of the Pennsylvania Militia was called in not by local officials but by The Reading to protect its own property interests. As all rail traffic in or out of Reading had by then been disrupted by The Strike, this troop arrived on foot to the Outer Terminal, The Reading’s jewel of a station one mile north of the railroad’s shop complex downtown. (In those shops, as if in spite of the rancor long building, now prevailing, had recently been accomplished a technological break­through toward the effective burning of coal-mine waste [culm] as productive fuel – doubtlessly bolstering the civic pride of many locals.) Partway between the two locations ran the 7th Street Cut – a narrow manmade ravine with 30′ vertical walls, through which ran at the time twin sets of tracks (today, only one set). A train, blocked from proceeding by. . . strikers or mob? Such distinction was by now hopelessly blurred… sat in the Cut amid piles of coal dumped from cars it had been hauling. With the immediate mission of freeing this blocked train, the newly arrived militia were unwisely marched straight into the Cut. For the militia this march through the Cut turned at once into a run through the gantlet. Pelted from above, taunted into panic by the strike-sympathetic mob which outnumbered them many-fold not only rocks and bricks, but chamberpots and, at one point, a boulder requiring two men to heft it came over the retaining wall and down upon the soldiers; sporadic gunshots (or leftover July 4 fireworks?) also rang from the crowd – the rattled militia troop shot (against orders to the contrary) into a throng of citizens at the far end of the Cut, where one of downtown’s main streets intersected the rail line. Their reckless gunfire killed 6 immediately and wounded dozens more, 4 of whom would succumb to their wounds to push the death count to 10. Pandemonium ensued, and the tragedy could have multiplied had the mob turned from the Massacre scene to storm The Reading’s nearby shop complex, the railroad’s “most valuable property”. On its face, this discrepancy in accounts may not appear to bear much importance. To the present commentator, though, here lies the moral center of the tussle – in Reading, and as well in the larger, national Great Strike. It is obviously a fool’s errand to attempt uncovering a rational motivation behind the erratic behavior of a riotous mob, but still it is reasonable analysis to consider the aura which the car shops must have exuded among the local citizenry, that is, just what their prospective burning-out would have signified how desperate and irremediable the prospect of such burning must have seemed even in the heat and fury of The Strike; for the car shops in Reading represented not simply Reading Railroad property nor the site of many workingmen earning their livelihoods, but the Engine of Progress dwelling in the midst of the community. The car shops represented the city of Reading’s vital position relative not only to its namesake railroad, but to the Industrial Revolution -the city’s proud identity, its place in the widening world of modernity. We may never be able to pin down the emotion which averted the Massacre-frenzied mob from besieging and torching the car shops, heedless of the danger of further loss of life, after the example of Pittsburgh. In light of facts and factors thus far discussed, bearing in mind that “many [of Reading’s] citizens viewed the new industrial order as something of a mixed blessing,” it is reasonable to adduce that there was some play of civic pride, even if somewhat confused. Brief mention was made above of a technological breakthrough just accomplished in the Reading car shops – development of an engine able to use coalmine waste as fuel. This was indeed but the latest, at the time, in a series of engineering attainments attributable to the Reading car shops. The Reading line’s founding statement mandated that it was “of the utmost importance that the locomotive engines to be constructed for this company be built with a view to the exclusive use of [Schuylkill Valley hard coal] as fuel.” Rather than relying on locals with no background to the technological task, The Reading searched out and hired diverse railroading pioneers from elsewhere. “They paid the best wages to mechanics, and that naturally attracted the best men in the country to Reading. “The men – and some women – who toiled at the shops were stubbornly proud of [the] national reputation for innovation and craftsmanship, especially when the Pennsylvania Railroad’s Altoona works were considered in comparison…” (They considered those Altoona shops as “Johnnie-come­latelies” due to Reading’s 23-year head start.) How would such workers have warmed to the prospect of Reading’s becoming “Pittsburgh on a small scale” – i.e., emulating the irrational mob actions of a Pennsylvania Railroad-dominated town? Leading up to 1877, the same precipitous finances – earlier unwise overspending to purchase coal lands; far too heavy floating debt; unprecedented losses in the Coal & Iron division’s operations; all amplified by the prevailing economic depression since 1873 – which caused Franklin Gowen to deal so peremptorily with labor also had him pushing the Superintendent of the shops in Reading to create new operating efficiencies through technological breakthrough. 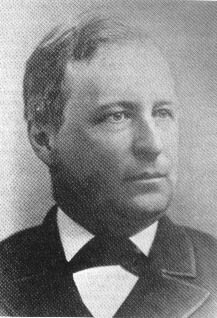 This Superintendent was John Wootten, and his particular innovation in response to Gowen’s mandate was the afore­mentioned culm-burning steam locomotive. Just prior to the prototype’s road test phase, Wootten was promoted to General Manager of the entire road. Though he remained actively interested and involved in the shops, General Manager Wootten was to stand side by side with his president during the ten­sions of The Great Strike. It was in his new position as General Manager that Wootten issued under his own hand Gowen’s ultimatum to the engineers that they leave their union, or be fired and blacklisted. It was likewise as General Manager that Wootten was used by Gowen to issue the fateful call for militia which set up the Reading Massacre. Nevertheless, Wootten, unlike Gowen, was a prominent local citizen in Reading, and it is reasonable to consider that the apparent breakthrough in steam propulsion design that he had recently fathered, which would come to dominate railroad motive power for some decades, must have been no secret to many locals, and indeed perhaps a point of pride. ‘So here pops up a new wrinkle, the point where individual industrial workers’ much discussed “alienation from the fruits of their labor” melts down, flows together into self-identification with those fruits, collectively. It is at this crux of the conflict that the mob turned, to reconsider, reconvene time and again in labor history to come. And this appears to have been the pivot not only in Reading but nationally. On the night of the Reading Massacre, labor radical lead­ers in Chicago were actively exhorting a gathering of 6000 to seize and harness The Strike’s hitherto spontaneous momentum. Had in the meantime Reading turned into “Pittsburgh on a small scale” – had the destruction and carnage continued into another night, consuming the car shops and however many more lives it might in the continuing fray – how might that have fueled the ire and vehemence of events yet unfolding in Chicago and elsewhere? – even as telegraphed reports of conflagration and carnage in Pittsburgh had already done in Reading. As it happened, Reading’s mob did not turn destructively on the car shops, and eventually order was restored throughout the city by federal troops with back-up from a squad of The Reading’s own Coal & Iron Police (held in the city from returning to its usual duties policing the coal mines). Bad as things were still to get, especially in Chicago where mobs engaged in a running battle with city police, The Great Strike proved finally to be no “railroad war” as some papers proclaimed but the birth pangs of a new American Labor movement which would grow up in tough, tumultuous decades to come. Franklin Gowen pretended to the moral high ground in The Great Strike’s aftermath: glossing over the Massacre altogether in The Reading’s annual report for 1877, he sought through retaliatory criminal prosecutions in Reading to pin responsibility elsewhere than on his railroad and himself The show trials Gowen mounted, though, unlike his earlier Mollie Maguire prosecutions, resulted only in the conviction of two confessed arsonists of a railroad bridge; of one man for inciting to riot; and of five others for rioting, who were each fined $1.00 and sentenced, in effect, to a few days’ jail time. The broader aftermath of The Great Strike reinforced Reading’s pivotal position for the burgeoning national labor movement. Strong labor sympathies were anything but quenched by the experiences of The Strike: the city served as host, January 1, 1878, to the first national assembly of the Knights of Labor, a federation of labor organizations and main contender for the next ten years to be the heart-and-soul of American Labor. The Knights’ platform – “resistance to monopoly, and a return to the old recognition of the dignity of labor” – appealed strongly to the most downtrodden. By 1886 the Knights of Labor reached peak membership of about 700,000 nationally, of whom some 10% were African-Americans. Eventually the Knights withered under a fearful backlash nationally after a maverick Knight member was among those convicted and hanged for causing Chicago’s Haymarket Riot of that same year. The Knights’ demise opened the way for Samuel Gompers and the American Federation of Labor to assume leadership of the maturing labor movement as the twentieth century loomed close. Nearly 50 years after The Great Strike, Gompers recalled, it as “the tocsin that sounded a ringing message of hope to us all.” Similarly, Reading’s owner James H. Maurer, an influential labor leader and politician well into the twentieth century, was spurred lifelong by vivid memories of the local uproar and tragic loss of life. Today, from the distance of 123 years, the Reading Railroad Massacre seems obscured by the larger spectacles of The Strike in Baltimore, Pittsburgh, St. Louis and Chicago. Given the city of Reading’s prominence as an industrial center in that age, however, and its pivotal importance to one of the largest corporations in the world at the time – not to mention that corporation’s already legendary lead in anti-unionism -the Reading Railroad Massacre is poignantly emblematic of a major transition point in the American social conscience as to the role, dignity and value of labor. The events of the Massacre epitomize a crucial turn in a polarization/rebalancing through which societies repeatedly pass: As the electric bolt sparks and hurtles between the polarized elements, an electrolytic meld occurs somewhere e.g., the Reading mob “identifying itself with the car shops as well as against the railroad which owned them” deflating the impetus to greater rage, fury, destruction, death. . . – and society “keeps the lid on,” that it may continue to seek a new equilibrium yet to be defined. Far more, and more severe, events were to occur, of course, in America’s history of labor relations. In the overall flow, however, the Strike of 1877 – including events in Reading heretofore underexamined as to their interrelationships – were of momentous, defining significance and durable impact. About the Author: Douglas L. Humphrey lives in Manhattan, where he works as an application programmer at a Wall Street law firm. A native Mid-westerner, he spent 1976-81 in southeastern Pennsylvania, during which time the research for this essay was undertaken as back-ground for an historical novel, still in progress. 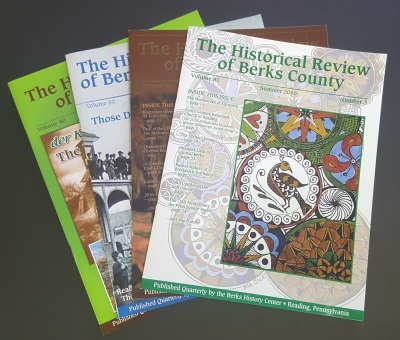 This article originally appeared in the Fall 2000 issue of The Historical Review of Berks County.